Planning is a great way to destress and be more productive in your day. Even the most disorganized person can find value in planning, whether it be in the actual process of it or the follow through. I happen to be in the first camp… finding more value in the process rather than being a slave to looking at my planner all day and checking off my lists. I’ve heard a lot of people tell me that they are disorganized and planning is just not for them. They love the spontaneity of just taking life as it comes. As a fellow impetuous person I can tell you that planning can still be a huge benefit, no matter who you are. 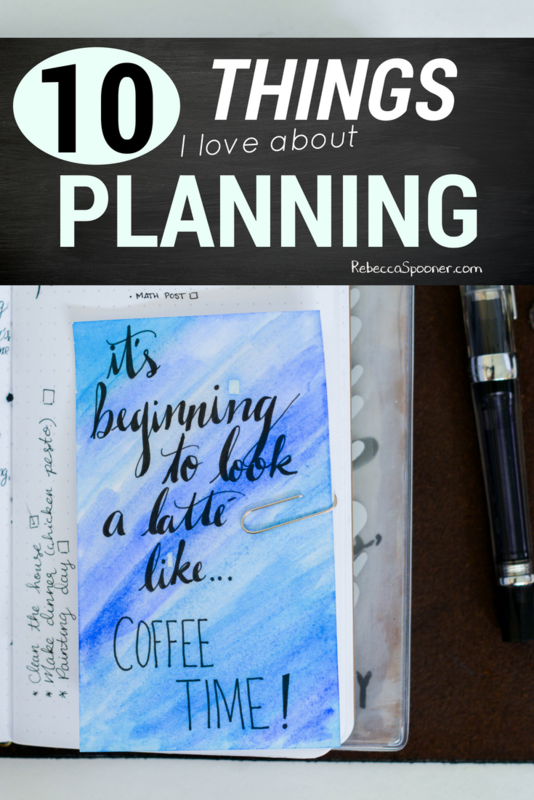 Today I want to share with you the top 10 reasons I love planning. With 5 young children and a busy lifestyle, stress is a close companion and yet something I am always aiming to reduce in my day (for both my own sake AND my family’s). Planning is creative, even when I am being minimalistic and simple, the clean lines and neat little boxes magically reduce stress. The process of creating, of thinking, of getting all the weight that is on my shoulders and the thoughts jumbling in my head onto paper in a structured and organized way. I breathe easier once I have my plan in place. I am such a visual person, I generally need to see something in order to remember it or have it “stick”. 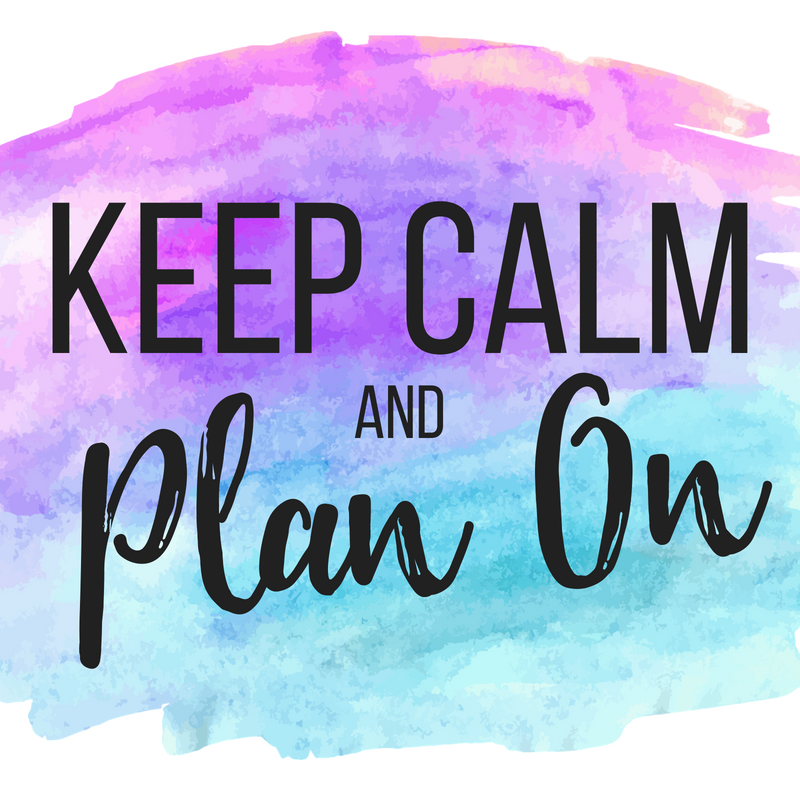 The more I can begin to lay out my process in a tangible way, the more likely I am to follow through with my tasks and goals, even if I never look at my planner again the next day. The very process of planning already helps me be more efficient with my time and realistic with my goals. I can’t even tell you the number of times I have missed appointments or totally forgotten about an event or get-together. It’s downright embarrassing you guys and I was sick of it! I love that planning helps me make sure I am on top of what is important to me. Without planning I have a really hard time organizing my tasks in order of importance and can waste a lot of time dithering at non-essential tasks (Facebook anyone?). As I lay out my day I usually find a natural priority emerges that helps me focus on the top goals first. I know, you’re judging me right now. I see you rolling your eyes! 😉 Planning really does help me have a more relaxed life though! Less stress with my husband because I didn’t forget to pay that bill (whew), less drama with people being offended that I forgot to bring something to the potluck, less frustration from my kids that they are late, again. Things just run smoother. We all need a creative outlet, whether we realize it or not. We find lots of ways to express who we are through various forms of music, the clothes we wear, even the way we keep our house can be creative! I am filled and inspired when I take the time to be creative in my day. When I don’t plan, I tend to stay in the same place, with the same tasks, a few being done but always a few more in it’s place. I never feel like I am taking ground or going after what I want. Life keeps me busy and I have a tendency to just… live. When I plan I make goals, I dream big and I try for and take risks that I would never normally take. It motivates and inspires me and I am a better person for it. It should be anyways. Sometimes we let planning become a chore. Instead of having a planner that fills us, inspires us, and motivates us… we become a slave to consistency and structure and making our planner what everyone else tells us it should be. But it CAN and SHOULD be fun! I love taking breaks from my planner because I dive back in with joy and purpose! Why do you love planning? Comment below! I love planning in order to see my whole week st one time. It also relaxes me. I plan because it’s one of my coping skills for my anxiety and depression. I also enjoy it to be able to express my creative side. Planning gives me something to look forward to and brings some structure to my already chaotic life. My mind is always overflowing with ideas and thoughts, and writing them down and planning on them has really given me a new perspective on life. Plus, no more anxiety attacks!! Your newsletters always revamp me to keep on planning! Thanks, Becky! It makes me feel like I have a handle on things and that my life isn’t careening out of control! It also makes me more efficient and careful with my time and where I place myself.